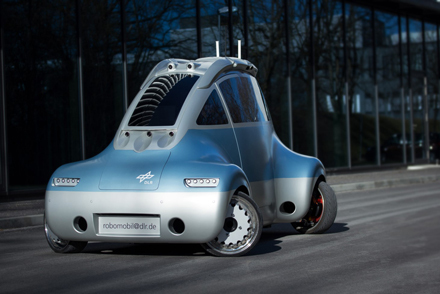 The ROboMObil is a by-wire electric vehicle built by the German Aerospace Center (DLR) for demonstrating the benefits of transferring advanced space and robotics technologies to electric road vehicles. This vehicle is propelled by four “wheel robots”—each consisting of an in-wheel electric motor, steer-by-wire actuator and a brake-by-wire unit—providing a high degree of actuation and maneuverability. For instance, the “wheel robots” allow independent control of the rotational (i.e, yaw-rate) and lateral (i.e., side-slip angle) vehicle motion, which are usually coupled in conventional vehicles without rear-axle steering. With the help of integrated surround video cameras and a three-degree-of-freedom force-feedback sidestick, the ROboMObil can be driven either manually or partially autonomously. The ROboMObil has been used as a demonstrator for various research topics, including integrated vehicle dynamics control (VDC), automatic driving, human-machine interfaces (HMI) and energy management. For example, shared-autonomy algorithms—where a supervision module continuously monitors the driver actions to guarantee fulfilment of road boundaries and collision avoidance with obstacles—is one of the most promising semi-autonomous operation modes. Reactive obstacle avoidance and autonomous parking algorithms, based on vision-based approaches, have been another relevant research area. A key feature of these systems lies in the exploitation of the “wheel robots” to improve vehicle operation in narrow spaces (e.g., decreasing the minimum distance for parking with respect to conventional front-steered vehicles), which is very attractive in highly-dense urban environments. On the actuation level, hybrid braking control strategies, focusing on the combination of electric motor and friction brakes to minimize energy losses and braking distance, have been also investigated. For further details about the ROboMObil prototype please visit the website and watch the video.